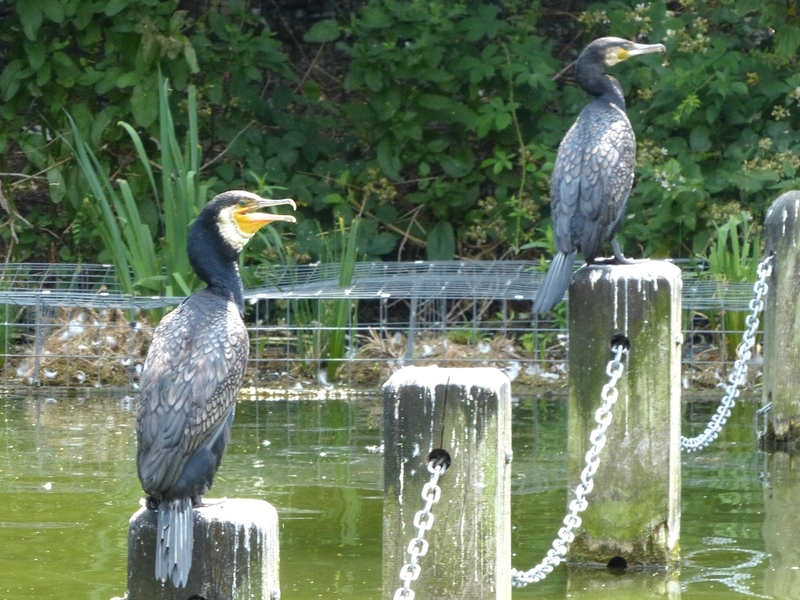 There were more Cormorants on the lake today. Evidently news is getting out that there are plenty of year-old fish. 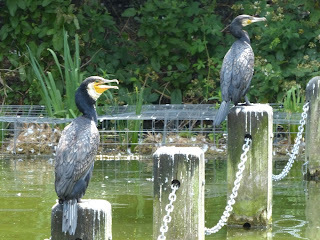 These could be seen in some numbers at the east end of the Serpentine, where there were also several Great Crested Grebes busily hauling them out. 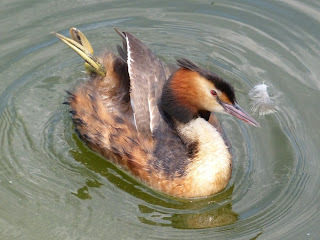 This one, having eaten enough for the time being, came to the edge of the Serpentine for a bit of preening. Here it lifts a wing to extend its leg, which had been getting cramped by being folded up. 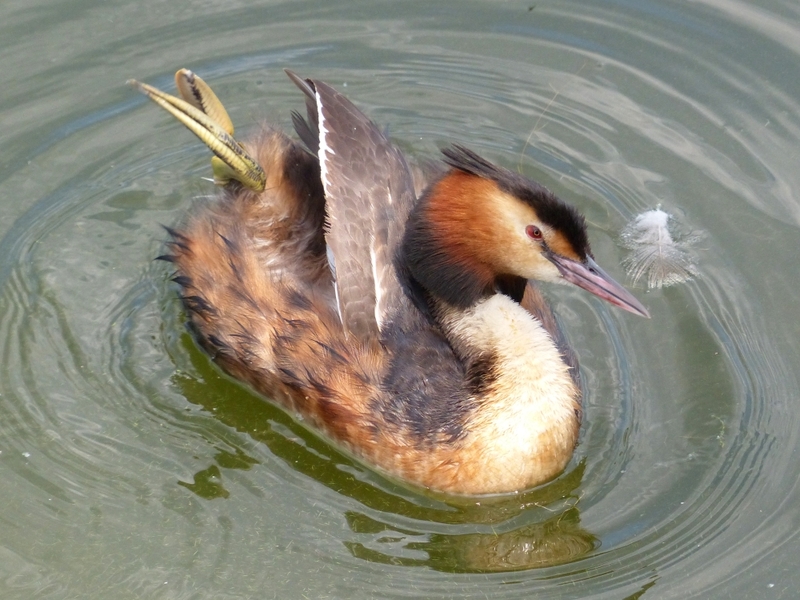 Like many water birds, grebes swim with one leg when they are not in a hurry. A pair of Common Sandpipers had been reported flying over Hyde Park this morning, so I went round the lake to see if they were on the shore, but they weren't. I also checked the Round Pond, with equal lack of success. The pond is now a mass of green algae, which are beginning to die and stink, providing ideal conditions for a growth of blue-green algae, which smell a lot worse and are also toxic. 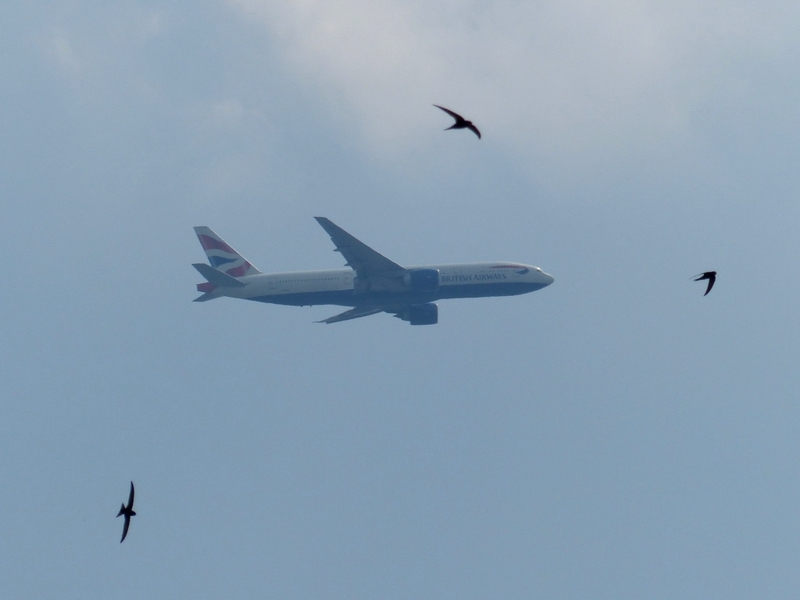 There are a lot of insects on the rotting mass, which in turn have attracted a good crowd of Swifts. 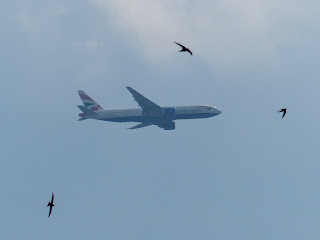 Here are some making a mockery of the lumbering form of a Boeing 767 going to land at Heathrow. New broods of Mallard ducklings have appeared on the Round Pond and the Serpentine, as well as on the Long Water. There are still not many big gulls -- indeed there were none at all on the Round Pond when I was there -- so it seems likely that a higher number than usual will survive. 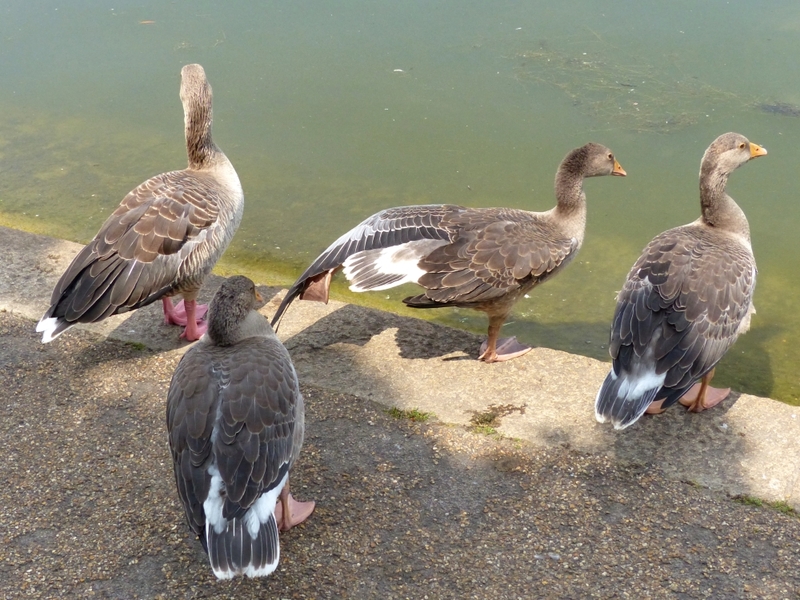 The six young Egyptian Geese at the Round Pond are also in good order. Here one of the three young Greylag Geese from the first brood hatched this year stretches a well developed wing. It is nearly time for their first attempts at flight. There were also several adult Greylags doing practice runs down the lake to try out their newly regrown flight feathers. I saw a large group of greylags at the round pond this afternoon and was around later in the evening to see and hear them take off for the Serpentine, so the flight feathers are well and truly established, and the exciting noisy evening take-off is back on the agenda. I wouldn't have been aware of any of this (nor much more) if it wasn't for your enlightening and amusing observations. Thanks.